Saturday evening’s Gala Concert saw the performance spotlight fall on two outstanding English soloists, a fine Welsh ensemble and a highly impressive Norwegian band. The compositional super-trouper also had a youth inspired national focus, with a world premiere from Paul McGhee balanced by freshly minted reprises from Lucy Pankhurst, Cai Isfryn, Simon Dobson, Idar Torskangerpol and Peter Meechan. 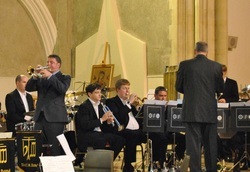 The latter will certainly have enjoyed his trip back to Manchester after hearing David Thornton and trumpeter Dean Wright delivered finely honed renditions of his alluring ‘Requiem Paraphrases’ and the fiendishly difficult ‘Apophenia’ – compositions of inventive authority and musical stature. Thornton was on superbly relaxed, free flowing form, bringing subtle articulated nuance and stylish phrasing to all three of his solo features. 'Paraphrases’ reeked of precision and musicality, whilst ‘Blizzard’ by Cai Isfryn, grew in intensity, momentarily becalmed before its finally flurry of elemental drive. Dean Wright also grappled with an epic triptych of instrumental writing, delivering a bravura ‘Apophenia’ that saw him find a pulsating rhythmic groove in the opening and closing sections balanced by an opaque lyricism in the flugel led central movement. The zinging piccolo trumpet flourishes in particular were played with a piercing intensity of razor sharp clarity. It was a performance of high quality, helped throughout by the excellent backing of the BTM X ensemble (as with David Thornton) led with considerable poise by Nigel Seaman.